WHILE the upcoming downstream facility is expected to be the next boost for local employment, it is the spin-off industries that will eventually generate far more jobs and wealth in the private sector. 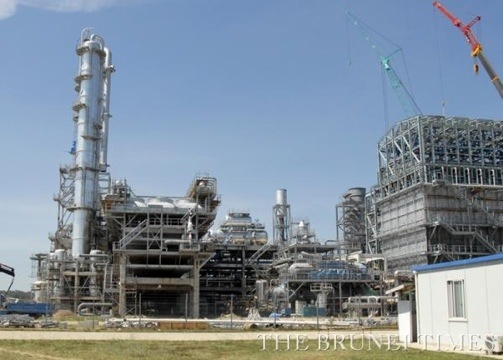 According to a recent report by Oxford Business Group (OBG), the petrochemicals complex which will be developed at the Sungai Liang Industrial Park (SPARK) by the Mitsui Consortium of Japan is expected to create around 500 new positions directly, and an additional 1500 indirect jobs. “Though a rough guide, for every position that the petrochemicals complex will create, three more will be generated to support the development,” said the report. 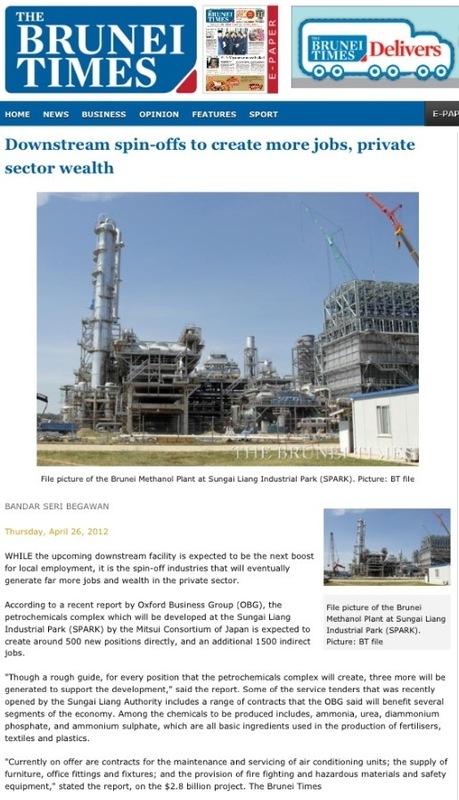 Some of the service tenders that was recently opened by the Sungai Liang Authority includes a range of contracts that the OBG said will benefit several segments of the economy. Among the chemicals to be produced includes, ammonia, urea, diammonium phosphate, and ammonium sulphate, which are all basic ingredients used in the production of fertilisers, textiles and plastics. “Currently on offer are contracts for the maintenance and servicing of air conditioning units; the supply of furniture, office fittings and fixtures; and the provision of fire fighting and hazardous materials and safety equipment,” stated the report, on the $2.8 billion project. Borneo Villas is an exciting and unique project undertaken in Sungai Liang. 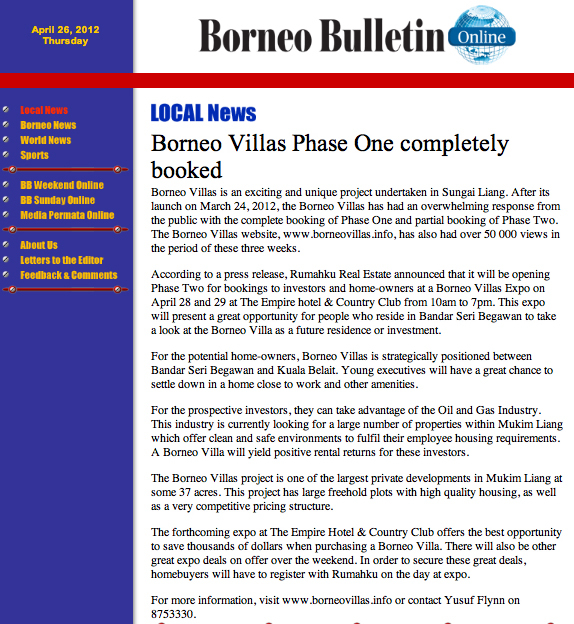 After its launch on March 24, 2012 the Borneo Villas has had an overwhelming response from the public with the complete booking of Phase One and partial booking of Phase Two. The Borneo Villas website, www.borneovillas.info, has also had over 50,000 views in the period of these three weeks. Rumahku Real Estate is proud to announce that it will be opening Phase Two for bookings to investors and home-owners at a Borneo Villas Expo on the April 28 and 29 at the Empire hotel & Country Club from 10am to 7pm. This expo will present a great opportunity for people who reside in Bandar to take a look at the Borneo Villa as a future residence or investment. For the potential home-owners, Borneo Villas is strategically positioned between Bandar Seri Begawan and Kuala Belait. Young executives will have a great chance to settle down in a home close to work and other amenities. For the prospective investors, they can take advantage of the oil and gas industry. This industry is currently looking for a large number of properties within Mukim Liang which offer clean and safe environments to fulfil their employee housing requirements. A Borneo Villa will yield positive rental returns for these investors. The Borneo Villas project is one of the largest private developments in Mukim Liang, some 37 acres. This project has large freehold plots with high quality housing, as well as a very competitive pricing structure. The coming expo at the Empire Hotel & Country Club offers the best opportunity to save thousands of dollars when purchasing a Borneo Villa. There will also be other great expo deals on offer over the weekend. In order to secure these great deals you will have to register yourselves with Rumahku on the day at expo. Rumahku Real Estate would like to take this time to say thank you to all the home-owners that have booked a Borneo Villa and to everybody that has been involved with this project. For more information visit www.borneovillas.info or contact Yusuf Flynn on +6738753330. 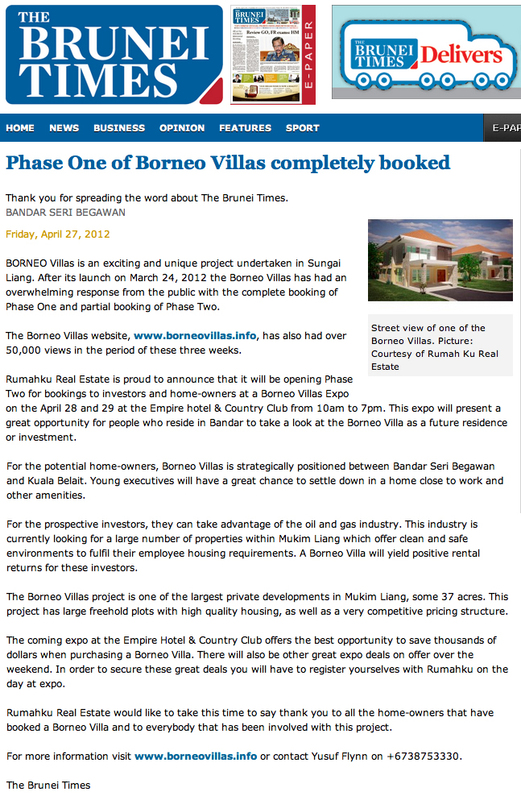 RumahKu Real Estate will be holding an expo to launch Phase Two of Borneo Villas as Phase One is fully booked. The venue will be at the Empire Hotel & Country Club on Saturday 28th April and Sunday 29th April. The team will be there from 10am to 7pm at the Conference Room in the hotel lobby. Come and visit us to take advantage of the competitive pricing of Borneo Villas and special Phase Two deal. Please note that after this expo, the special launch price will no longer be in effect (price will increase). 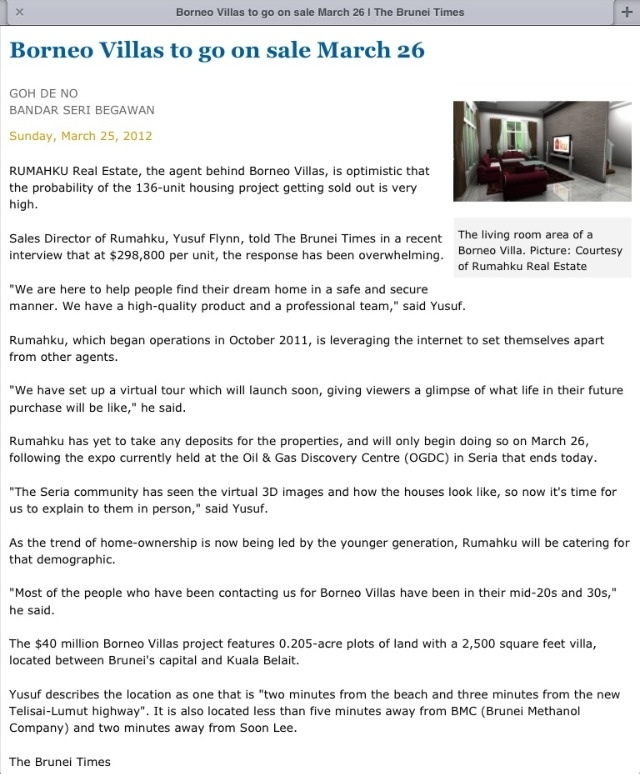 Confirm your Borneo Villa by placing a deposit with RumahKu Real Estate starting Monday 26th March. Thank you for your support of the Borneo Villas project. RumahKu Real Estate will be open for the collection of deposits as of Monday 26th March 2012 to confirm your villa. For your convenience, we will also be stationed at the Oil and Gas Discovery Centre (OGDC), Seria from 27th to 31st March 2012 to further discuss the project with you and confirm your bookings. As of today, RumahKu Real Estate has taken a significant number of verbal bookings for plots in the Borneo Villas project. Please consult one of the team members at RumahKu Real Estate to find out which plots may be available for you. We look forward to hearing from you soon and seeing you at our expo (there will be great deals available at the expo).